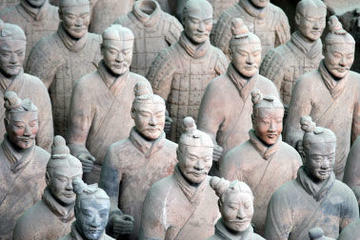 The Xian Wall is the most complete city wall that has survived China’s long history. 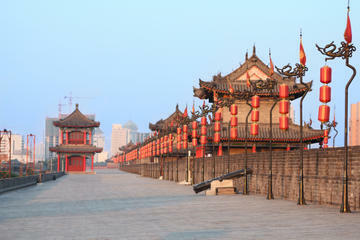 It was built originally to protect the city in the old Tang dynasty and has now been completely restored. It is possible to walk or bike around the entire perimeter, about 14 km. Click on the arrow below to watch a short video. 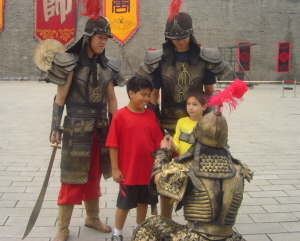 We accessed the wall through the South Gate. 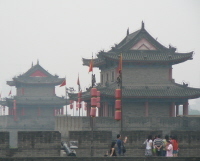 The wall is 12 meters high and from here you get a glimpse at the commotion both inside and outside the City Walls. There was a lively contrast between the tall buildings rising next to little markets bustling with activity. After spending some time looking at all the defensive gear on display at the wall, we decided it was time for some action and what better than to ride on a piece of history! We hired our bikes from the rental place at the South Gate. The bikes were a bit rickety but did the job. It’s only a couple of dollars to rent the bikes, but you have to leave a deposit, about $15-$20 or so per bike. They had tandem bicycles available, so we let Christopher ride with dad, just a little bit of "insurance" in case he started acting up mid-way through the route. 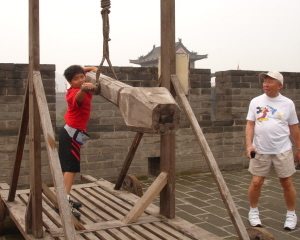 It took us about 3 hours to go all the way around the Xian City Wall. 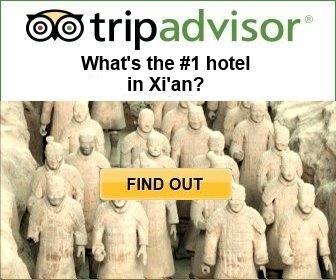 Supposedly you can do it in two, but we stopped at the different gates and watchtowers to take pictures and just to watch Xian's residents going about their daily routines. This is an easy ride, a little bumpy perhaps, but nothing too strenuous. Make sure you bring something to drink, specially on hot days. There were very few vendors around once you get underway, so better be prepared. Thankfully, the Wall was wide enough and we managed not to run over anything or anybody! There was also some sort of "changing of the guard", specially for tourists I'm sure, at one of the gates and it was fun to take a break and watch. 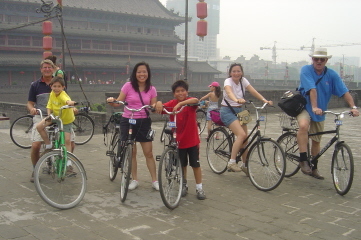 Grandma and Grandpa were not up to biking the Xian Wall, so they rode the golf-carts that brought them around and stopped at the interesting points as well. I believe their ride took about one and a half hours. 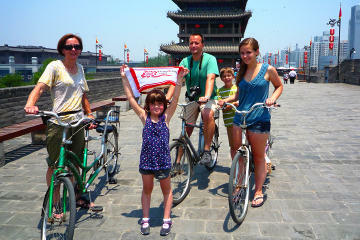 Cycling in China can be the experience of a life-time. China is so vast, that even with a year on the road, you would only get to see a fraction of it. The different provinces have a lot to offer and the choices are countless. Let Peter lead you on your journey. 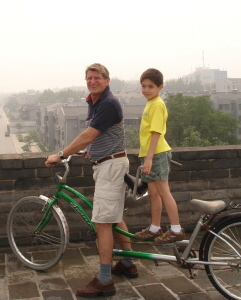 Peter spent two years in China, and cycled throughout the land. 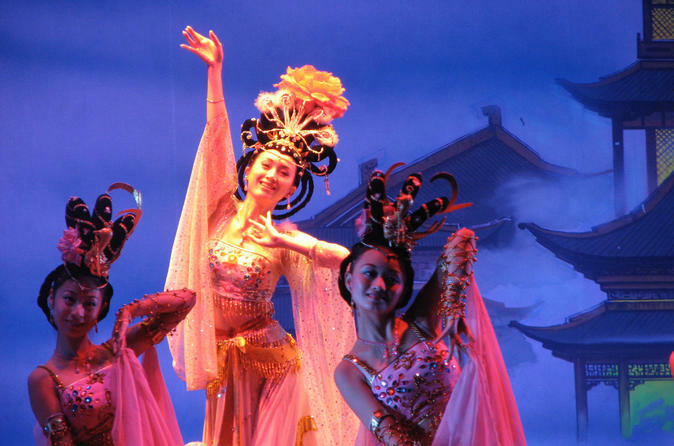 In his website Bicycle Adventures.com he exposes the different aspects of bycicling in China, from how to prepare and plan for your trip to an extensive guide through all the regions he has covered. 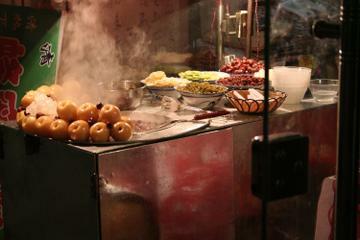 Read about Peter's bike ride from Xian to Chengdu here.